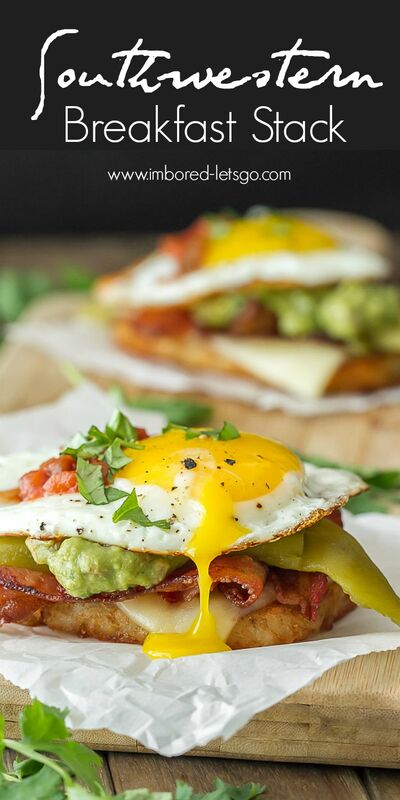 Hash browns, bacon, egg, green chili, cheese and guacamole…this Southwestern Breakfast Stack has it all! I’m not a huge breakfast eater. I’m more of a brunch kind of gal. When I do make a “big” breakfast it usually includes bacon and eggs! Crispy hash browns on the plate? Even better! I thought this Southwestern Breakfast Stack would be a fun and tasty way to incorporate all my favorite breakfast goodies in one nice, neat pile. See how fancy? Bake them in the oven and you have yourself a BIG, delicious piece of bacon. Perfect for a BLT sandwich…or in this case, a Southwestern Breakfast Stack! For the base of this stack I used a frozen hash brown patties. Typically, that’s not something I’d keep stocked in the freezer but my youngest son is home and he buys all kinds of “weird” stuff. Damn, I’ll admit it…they’re really, really good. Like a big ol’ tater tot, such a guilty pleasure! They make the perfect base for these Southwestern breakfast stacks. Once you have your bacon and hash brown patties cooked, it’s just a matter of layering on your favorite cheese, a green chili (Hatch chilies are awesome), guacamole and fried egg on top. Garnish with some cilantro and salsa if you like…or not, it’s all good! Cut bacon in half. On parchment lined baking sheet, weave bacon pieces. Place frozen hash brown patty on baking sheet next to the bacon. Bake until bacon is cooked and hash browns have crisped up, about 15-20 minutes. Flip the hash brown patty half way through cooking. 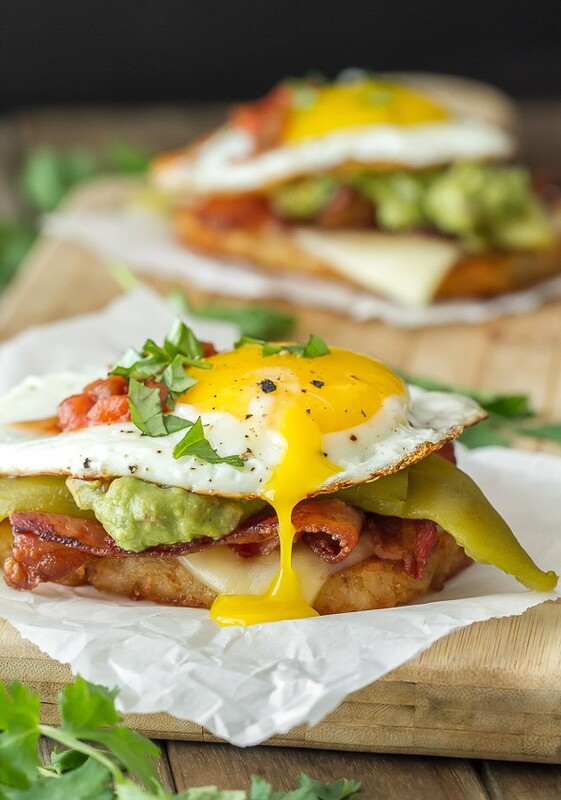 To serve, layer hash brown patty, slice cheese, bacon, green chili, guacamole and top with a fried egg. Garnish with chopped cilantro and a spoonful of salsa. 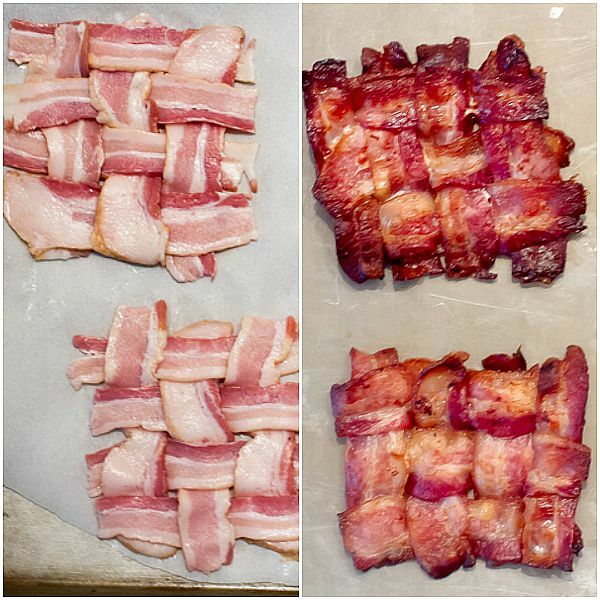 To weave the bacon, lay 3 half pieces of bacon on a parchment lined baking sheet next to each other vertically. Fold the middle piece a third of the way back. Lay one half piece of bacon horizontal. Fold the middle piece down over the horizontal piece. Now fold back the two outside pieces. Lay another piece of bacon down horizontal. Fold those 2 pieces back down over the horizontal piece. Repeat process. Breakfast is my favorite meal and I love eggs. Your bacon idea is so clever. I am excited about trying it. Thank you for sharing. 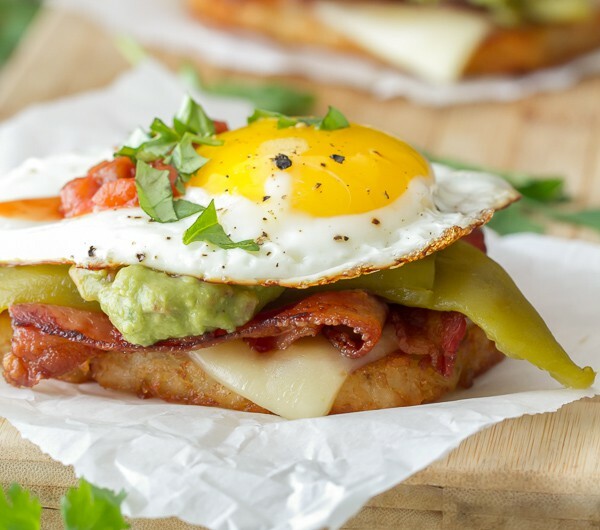 Bacon basketweave, avocado, fried eggs, hash browns…..holy cow that looks good! Pinning this one for sure. OMG that bacon stack is genius! That and the avocado pairing. Yum!! I just figured out what I’m having for breakfast today – this looks incredible! I love the bacon basket idea! this. is. a. gourmet. breakfast! I do the same thing…or worse, grocery shop when I’m hungry! Okay, I am going to save this and try it! I love anything breakfast but eggs and bacon, yeah, that is my weakness! Bring it ON! This looks amazing. Definitely making this one weekend soon. Bacon and avocado go together so well! 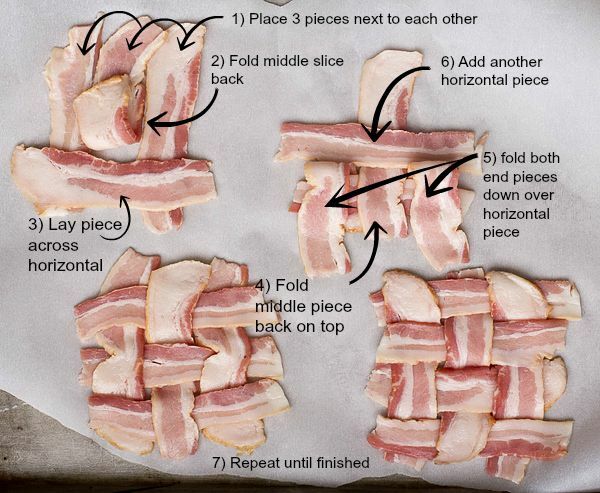 I am totally making this and I look forward to eating that bacon weave mostly! Maybe I’ll make an extra one for the side! An extra one…I like the way you think! Loving the basket weave bacon! that is awesome! This looks like a great sunday brunch food. That is one loaded breakfast. Somedays you just gotta have stuff like this. Love the egg on the top! Oh my gosh this looks amazing. The best thing about breakfast are bacon and eggs, trying this. Wow! What a great way to start the day. I love what you did with your bacon! This breakfast looks AMAZING! My idea of the perfect breakfast sandwich (using turkey or beef) and love the weave idea as it looks more stable. I really hate taking a bite of a sandwich and feeling something drop out the side. Those bacon stack made me so hungry right now – such a colorful and delicious breakfast. Oh yum! I would LOVE this for breakfast! Maybe we will try these this weekend! Thanks for sharing! omfg this looks amaaaazing, Judy! I love that bacon idea and the ooey gooey egg in this photo is to-die-for!! A great way to start the day. A great breakfast. Breakfast 2.0! Looks fantastic and I bet it is to die for. Definitely making it soon! Beautiful breakfast stack you have here; I’m sure it tastes just as good in the north and we plan to find out soon!! Breakfast couldn’t look much better than this! Love what you did with the bacon! Such a cool idea, now that is some breakfast happening for sure ! I love breakfast and I especially love dishes that bring so much together.. excellent post and excellent recipe!